In 1984, I became a sales rep for a wholesale foods distribution company in Salt Lake City. I loved the fact that we supplied grocery stores with healthy breads and products. In 1991, I began working on new lines of healthy breads that could be locally baked and distributed here in the Utah/Idaho area. My first line was called Organic Gardens Health Breads, which was a full line of whole grain breads, including: Honey Oat, Sunflower, Multi-Grain and Honey Whole Wheat Bread. The next development was the Granny's Delight bread line, which included a Potato White Bread, Sprouted Wheat, High-fiber Whole Wheat and a multi-grain bread called Bountiful Harvest. These breads became very popular with stores and the public. In fact, the hardest thing was keeping up with demand. We finally called on one of the large bread companies to help with distribution of the products and they accepted. After a few years, the Granny's Delight name became a household word and began to excel in sales. As growth continued I was told by my distributor at the time to add chemical preservatives to lengthen shelf life and use powdered cellulous to the fiber bread instead of pure wheat fiber concentrate. This would cheapen the cost and give the distributor more profit. I refused and let it be known that Granny's Delight would always remain healthy, chemical free and sawdust free -- that's what I discovered powdered cellulous was that they suggested using. That was in 2002 and here we are growing and supplying the markets and health conscience crowds still. Peak Distributing, whom I worked with in 1984, currently delivers our products to the grocery stores and Health markets in Utah. Paul Stoddard, a long time friend, is an independent contractor in charge of distribution in Idaho and Southern Utah. I created Granny's Delight Bread in 1992, and Federally Trademarked and registered the name in 1995. 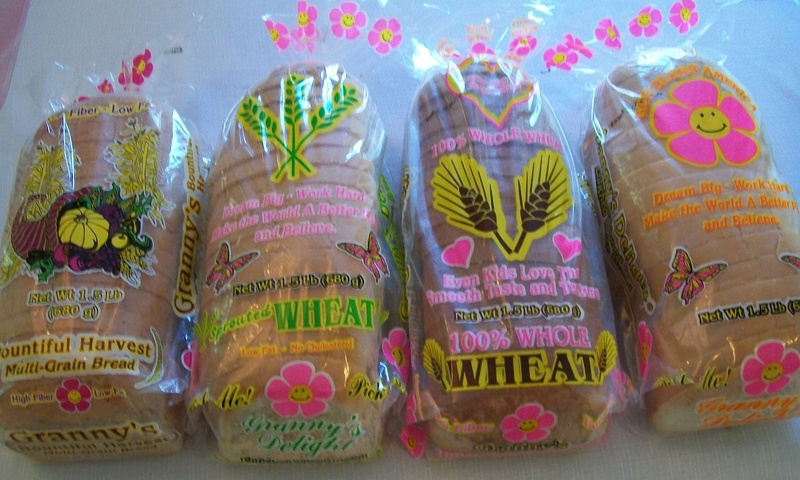 I also own Granny's Bread and Bountiful Harvest which are Utah Registered since 1995. It took many years of development to get where we are and the recipes we use have been my personal choices. My family, friends and neighbors have been testers for my recipes. I have to give special thanks to Melody Beutler, Dietician/Nutritionist and Foods/Nutrition teacher at Davis High School for her help in developing the nutritional contents and labeling for my bread recipes over the years. Many thanks go to Vanner Johnson and Mike Howell for their patience with the critical baking process for making the best breads and their willingness to try what I told them even when sometimes it seemed impossible to accomplish with these breads, especially the High-Fiber Bread, which is difficult to bake. I have always insured that the baking and production of our products be done by reputable bakeries along the Wasatch Front that met our baking and quality standards. Our current baking facilty is Dunford Bakery in West Jordan who has recieved one of the highest quality inspection certifications available, the AIB inspection and compliance. Thanks there goes to Ron Stevens, Tony Stevens and Micah Stevens for their help in baking my bread with such quality. Special Thanks also to RKSDEV, for this Website and Facebook Page that has taken so much of their time, talents and effort to create. Wonderful Job Guys ! !